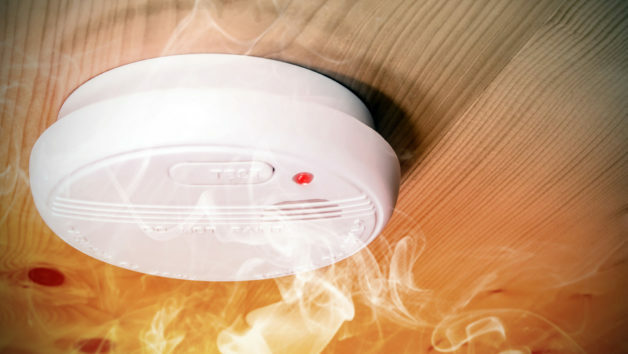 The Best Smoke Detector for a Home, and the Worst: Which Do You Have? First the good news: After decades of public education by firefighters and other community groups, Americans have finally gotten the memo that smoke detectors are a good thing. According to the U.S. Fire Administration, 96% of homes in the U.S. have at least one smoke detector to alert residents to a fire on the premises. Now the bad news: There are actually two types of smoke detectors, and the most popular one is actually the less effective. So which one’s the best smoke detector for your home? Here are the facts on these two main types of smoke detectors—ionization and photoelectric—and how you can use them to keep your home safe. Ionization alarms use a small bit of radioactive material to detect the incinerated particles that make up smoke. They’re also the most common—the National Fire Protection Association found that 90% of all the smoke detectors in the U.S. are this type. The problem? Ionization smoke detectors are sluggish at detecting slow-burning or smoldering fires, such as those caused by the most common types of fire starters—namely cigarettes, frayed electrical wires, and fireplace embers. By the time an ionization alarm activates, smoke and carbon monoxide levels have likely built up sufficiently to disorient you and make you unable to escape your home. Joseph Fleming, a deputy fire chief at the Boston Fire Department, says as many as 30,000 people in the U.S. have died in fires since 1990 because their homes were equipped only with ionization detectors. So why, then, do ionization alarms get placed in homes? For one, they’re cheaper—typically half the price of a photoelectric smoke detector—and the battery on an ionization alarm tends to last longer. Just beware: Since ionization alarms have such a high false-alarm rate—they can be triggered by cooking or even showering—many people disconnect or “shush” their ionization alarms. If you do, be sure to turn them back on! A photoelectric smoke detector uses a beam of light to detect smoke particles. And although these detectors are twice as expensive as ionization alarms (it’s no wonder they’re less popular), data from the National Institute of Standards and Technology has found that photoelectric alarms can detect smoke 20 to 50 minutes faster—that’s a significant head start! Photoelectric alarms are considered the best way to protect your family from fire. In fact, in 2008 the International Association of Fire Fighters recommended that photoelectric alarms be the only type of device installed; several states, including Massachusetts, Vermont, and Maine, require photoelectric alarms in new residential construction. As for the home you’re currently in, experts recommend you invest in photoelectric smoke alarms in bedrooms and hallways, and leave the ionization smoke alarms in the kitchen, if at all. And ideally you’ll want your alarms to be hard-wired so they don’t rely on battery power (61% of homes have smoke detectors that work only on battery power). Hard-wiring also allows for the devices to be interconnected so that if one detector goes off, they all do (just 25% of homes have interconnected smoke alarms, even though new homes have been required to have them since 1976). In addition to smoke detectors, all homes should have separate detectors for carbon monoxide—an odorless gas emitted by furnaces, stoves, grills, and other appliances that burn fuel. Carbon monoxide is the leading cause of accidental poisoning, causing about 400 deaths a year.